The manufacturing process time was dramatically reduced by the introduction of an adhesive application, and we were able to recommend a conveyor handling system that offered further increases in productivity through designing and installing a multiple panel vs. single panel rolling conveyor, a powered turntable to improve speed and efficiency in the process, conveyor speeds that reduce the need for any storage and handling during manufacture and an automated scissor lift system facilitating improved handling and direct dispatch. Our expertise and experience in automated systems means we can look at a project and create a customer solution that delivers measurable and tangible benefits to companies quickly. We can then really add value through competitive pricing that helps customers achieve the tangible financial benefits they are looking for in today’s economic climate. 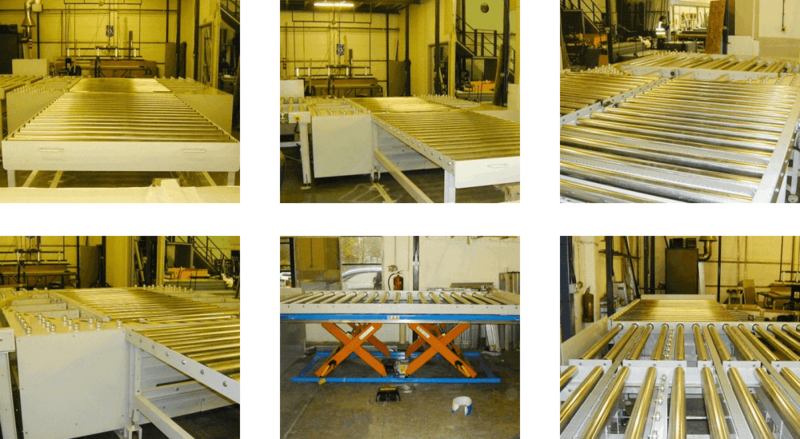 The images below show the automated system, including a custom designed turntable roller conveyor, allowing the manufacturer to automatically rotate the material as part of the process. All our solutions are tailor-made to client exact specification and delivered to the clients timetable, not our. This allows to to minimise the disruption to our clients business. To discuss your requirements with us, please give us a telephone call today on 01405 768 900.